Airtel Payments Bank after having rolled out its pilot services in Rajasthan last month, followed by Andhra Pradesh and Telangana, on Thursday has now launched its services in Karnataka as well. 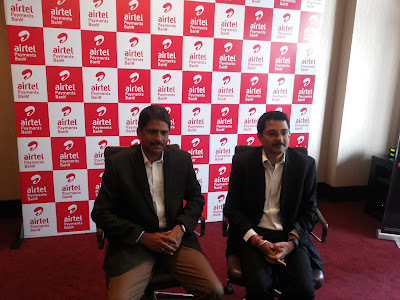 “This service will be rolled out across 12,000 Airtel retail outlets. These outlets will act as banking points, and going forward, we will increase it to 20,000. Apart from 7.5% interest on savings, customers can get one-minute talk-time free on every rupee deposited, and also get personal accident insurance worth Rs 1 lakh,” said Airtel Payments Bank MD and CEO Shashi Arora. He adds that one can open an account in few minutes with the Aadhaar number, and the Airtel mobile number will be the account number. “In the case of other service providers, they will get a separate account number. Everything is paperless and customers can access services over their mobile phones. In Rajasthan, over one lakh customers have opened savings accounts in less than two weeks of commencement of the services. Airtel Payments Bank plans to develop a nationwide merchant ecosystem of over 30 lakh partners which will include small kirana stores, small shops and restaurants. “We have close to one lakh merchants in Karnataka, and we will take this to two lakh merchants by the end of March, next year,” said Airtel CEO (Karnataka) C Surendran.